MANILA, Nov. 20 (Xinhua) -- China and the Philippines agreed on Tuesday to upgrade their ties to comprehensive strategic cooperation and jointly advance the Belt and Road construction. The decision was made at a meeting between visiting Chinese President Xi Jinping and his Philippine counterpart Rodrigo Duterte. The two leaders reached important consensus on building bilateral relations on the basis of mutual respect, sincerity, equality and mutual benefit, and win-win cooperation. Xi told Duterte that he is delighted to visit the Philippines and is touched by the Philippine people's warm welcome, especially the kids' cheerful smiles. Calling China and the Philippines "close neighbors with exchanges going back a thousand years," Xi said good-neighborliness, friendship and win-win cooperation are the only correct choice for the two countries. 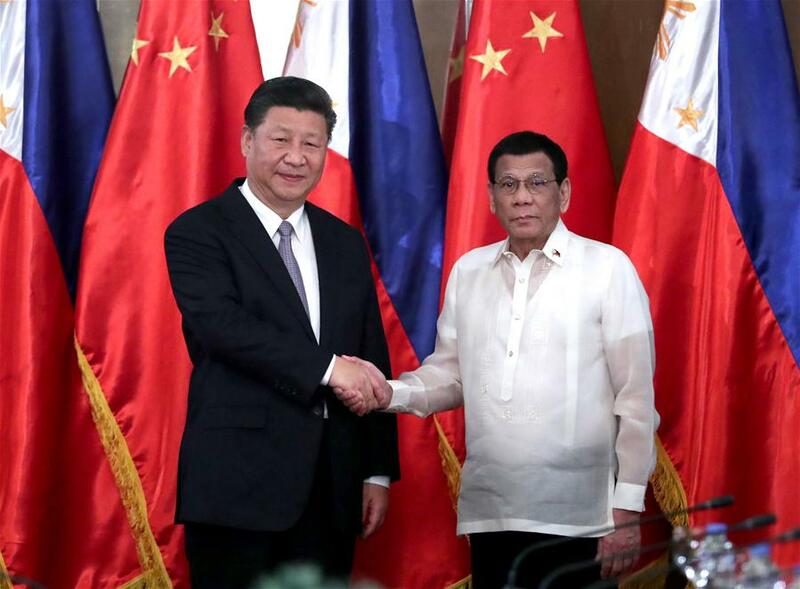 The Chinese president said he has had in-depth exchanges of views on bilateral relations and issues of common concern with Duterte in their six meetings over the past two years and consolidated consensus and friendship. With joint efforts, the two sides have had fruitful cooperation in various fields and ushered in a new chapter in China-Philippines relations, benefiting both peoples and contributing to regional peace and stability, Xi said. China is willing to carry forward its traditional friendship with the Philippines and deepen the cooperation, so that the two countries can forever make good neighbors, good friends and good partners and share the prosperity, he said. The upgrade of bilateral relations meets the need of their development and the expectation of both peoples, Xi said, calling on the two sides to enhance strategic guidance on bilateral relations by the two heads of state, promote exchanges on all levels and consolidate strategic mutual trust. China supports the Philippines in choosing a development path that suits its own national conditions, he said, adding that the two countries should deepen their cooperation on three pillar fields, namely security, development and culture. China also firmly supports the Philippines' fight against drugs and terrorism, will continue to provide assistance within its capacity to the Philippines to implement more public livelihood projects including poverty reduction, and expand exchanges and cooperation on education, culture and tourism, Xi said. The Chinese president said the Philippines is an important partner in jointly building the Belt and Road and urged both sides to deepen the synergy between the Belt and Road Initiative and the Philippines' development plans, and boost cooperation in fields such as infrastructural construction, telecommunications and agriculture. Noting that China and the Philippines share extensive common interests on the South China Sea, Xi said the two countries can continue to manage differences through friendly consultations, promote practical cooperation on the sea and make due contribution to regional peace and stability and the welfare of the peoples. Xi said China supports the Philippines' role as the country coordinator for the China-Association of Southeast Asian Nations (ASEAN) dialogue relations and the China-Brunei-Indonesia-Malaysia-the Philippine East ASEAN Growth Area (BIMP-EAGA) cooperation. China is willing to work together with the Philippines to upgrade China-ASEAN relations and the East Asia cooperation, he said, adding that China and the Philippines, both emerging economies in Asia, should increase coordination and cooperation in regional and international affairs. Extending a warm welcome to Xi, Duterte noted it was the first state visit to his country by a Chinese head of state in 13 years. The visit, a milestone of historic significance in the Philippines-China relations, will open a new chapter in their cooperation, he said. He said the Philippine side congratulates the Chinese side on the achievements it has made in its 40 years' reform and development, adding that he believes the Chinese people are sure to realize their Two Centenary Goals. The Philippine side is ready to deepen the relations of comprehensive strategic cooperation with China on the basis of mutual respect, mutual understanding and sovereign equality, strengthen cooperation in trade, investment, agriculture, defense, health, drug control, improvement of livelihood, infrastructure construction and energy, as well as expand cultural and people-to-people exchanges in education and human resources. The Philippine side agrees that countries in the region should jointly safeguard peace and stability of the South China Sea, and stands ready to actively promote the development of relations between ASEAN and China, he said. China has stood on the right side of history in dealing with international affairs, Duterte said, adding that the Philippine side is ready to carry out closer communication and coordination with China within multilateral frameworks such as the United Nations. The Philippines is the last stop of Xi's three-country Asia-Pacific tour. He has visited Papua New Guinea, where he also attended the 26th Asia-Pacific Economic Cooperation Economic Leaders' Meeting, and Brunei.